In perhaps their most basic uses, stairs and steps share a single meaning. Both refer to a series of steps—those "structures consisting of a riser and a tread," as the definition of step puts it. But how about in practical use: are they in fact applied differently? Steps lexically has the emphasis on the single structure that is the riser and the tread. The singular form step is the usual way to refer to the structure (evidence of "the bottom/top step" abounds while evidence of "the bottom/top stair" is scant, especially in American English). The fact that the movement signaled by each footfall is also called a "step" perhaps contributes as well. In its earliest known use, which currently dates to the turn of the last millennium, stair refers to what we would now call a set of stairs: you would go "up the stair" (but you’d say it in Old English) to get to the second floor. Step, on the other hand, in its earliest known use about 200 years previous, refers to the single structure that we would now also most often call a step. When they’re outside, they’re more often called steps than they are called stairs. We have, for example, far more evidence for phrases like "on the steps of the Capitol" than for "on the stairs of the Capitol." 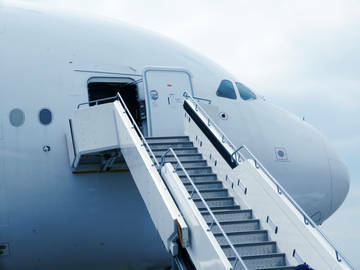 When it’s full sets of the things in question, the phrase "flight of stairs" is far more common than "flight of steps." When the set is of an abbreviated sort, however—like when it connects two interior spaces at slightly different levels—steps is the usual choice: "steps down into the living room." Stair is the term that appears in compounds having to do with architectural structures: staircase, stairway, stairwell. Meanwhile step lends itself to figurative use, as in "every step of the process." And that may not be all there is to say about steps and stairs, but it’s a step in the right direction.